Four of Oregon’s oldest sentries stand duty along this stretch of the rugged, yet beautiful, Oregon seashore. Three of them beam pure white light miles out to sea. 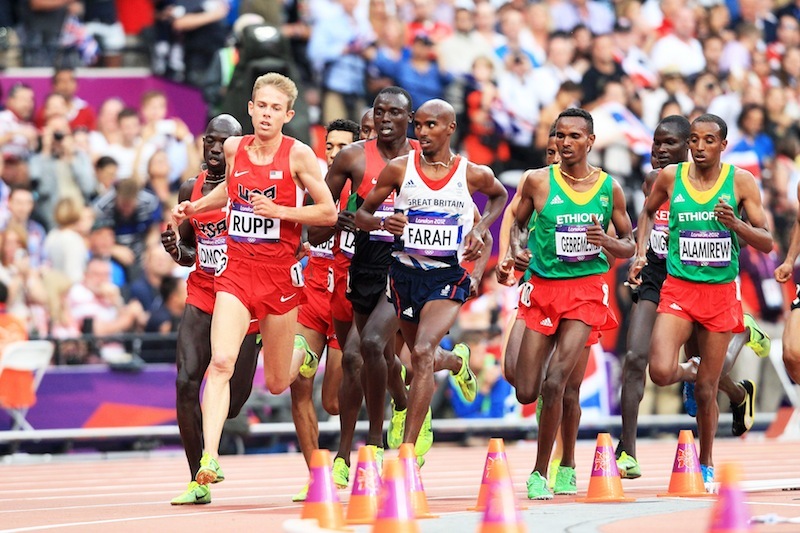 Two of them are icons of their class. One is rebuilt to mimic the original, which warned wooden sailing ships of the perilous Oregon Coast. Whether you’re a foodie, a dune rider or a tide-pool explorer, these coastal lighthouses will guide you toward your own discoveries along the Central Oregon Coast. 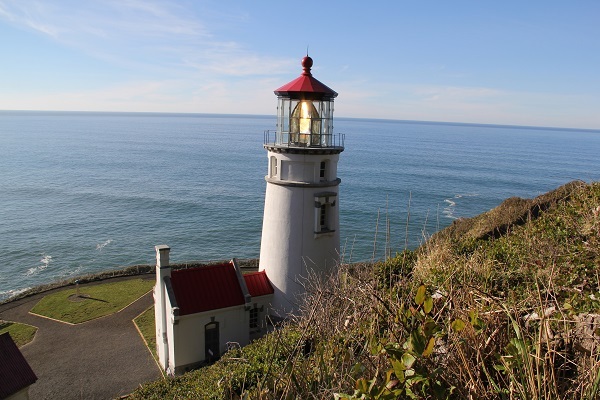 This section of the coast is an easy daytrip from Yaquina Head Lighthouse north of Newport to the Umpqua River Lighthouse, but leave time to see the sights, smell the sea and taste some of its fantastic bounty. Anyone who seeks adventure here will not be disappointed. Atop a rocky reach that juts into the Pacific Ocean at about milepost 137 on Highway 101, Yaquina Head Lighthouse is Oregon’s tallest lighthouse and is a magnet for visitors of the Central Oregon Coast. To reach it along Lighthouse Drive, you’ll pass many a viewpoint to watch for seals, seabirds, sea stars and whales, depending upon the season. The lighthouse was first lit August 20, 1873. When electricity was turned on in 1966, it signaled the end of the era of lighthouse keepers. 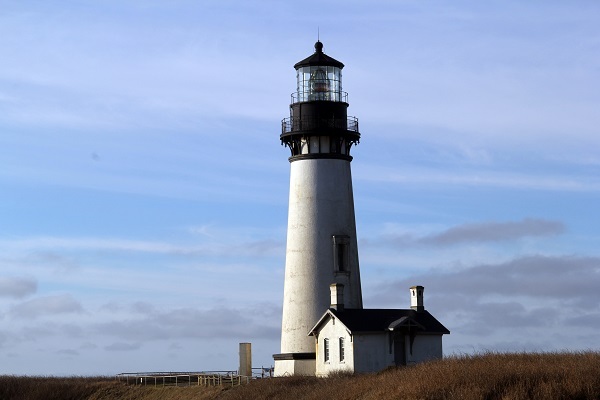 Today it serves as a beacon for those who want to learn about Oregon’s lighthouse legacy. Passing Agate Beach Golf Course at milepost 138, coastal travelers encounter the Newport city limit. To the right is the Yaquina Bay Lighthouse at about milepost 142. To the left under the Yaquina Bay Bridge, you’ll find your way to the Newport Harbor along Bay Boulevard. Back on the highway, cross the iconic Yaquina Bay Bridge. It’s much more than just a link between two shores, it’s also a symbol of the Oregon Coast itself and is listed on the National Register of Historic Places. The bridge deposits you close to milepost 142, where there are more worthwhile destinations. The Oregon Coast Aquarium and the Hatfield Marine Science Center are enjoyable for the whole family. Meanwhile, Rogue Ales has been imperative to craft beer drinkers in this region since 1989. Brewmaster John Maier has brought many creative libations to market for almost twenty-five years. 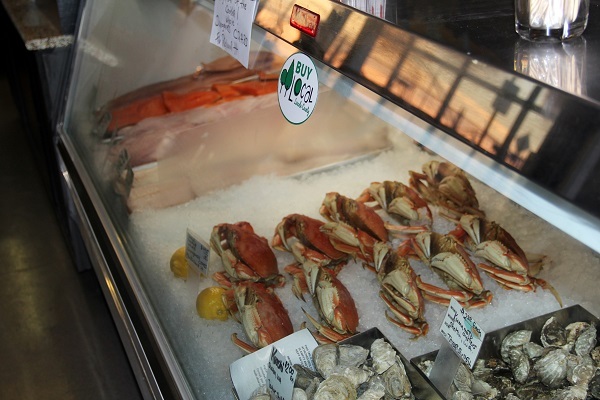 After crab season opens in December, look for crab races to begin at the Rogue Brewery. The first of many Oregon State Beaches, South Beach State Park unfurls near milepost 144. You needn’t been in a hurry to jump off here to wade in the ocean because there are dozens more beaches, parks and waysides sprinkled along the highway from here south. South Beach State Park is open, grassy and a good place to pitch a tent. 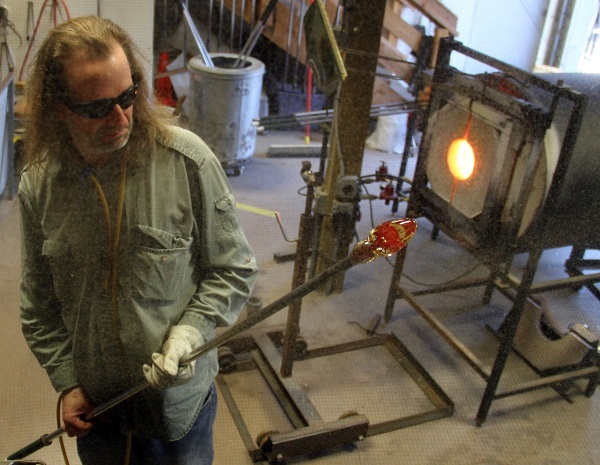 Like jewels on a necklace, state parks, beaches and waysides are strung along the coastline. The string is broken only by tiny, quaint oceanfront towns. Seal Rock State Park at milepost 150, Driftwood Beach State Park at 153, Governor Patterson State Park at 157, Beachside, Tillicum, Smelt Sands and more. 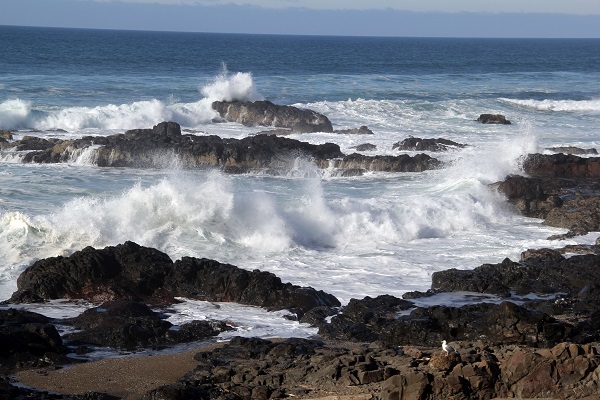 Yachats, with its rocky shoreline and tide pools, is at milepost 164. There’s a great overlook at the state beach here and easy access to the pools below. 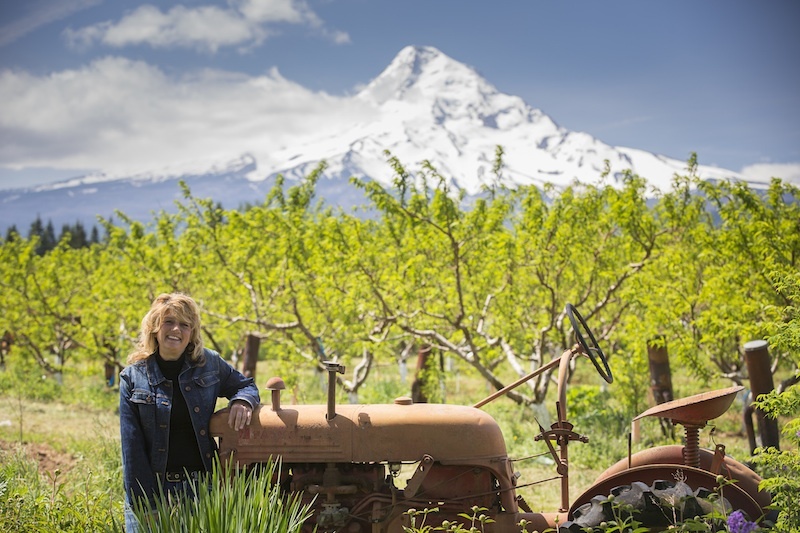 Nearby are bakeries, wineries and a visitor center with more information about what to do and see. A couple of miles south, Devils Churn is a great display of hydrodynamics. The ocean surges into a basalt chasm of rocky Cape Perpetua and shoots up the cliff walls. During stormy weather, the marine geysers that erupt here are sights to behold. The whole cape is a scenic wonderland, with twenty-six miles of trails, a stretch of old growth forest and a campground that’s open in the late spring and summer. Cummins Creek Trail will take you into a wilderness area, where you can still find old growth Douglas fir and spruce isolated from development. A dozen more oceanfront parks and waysides pepper the intersection of land and sea south from Neptune at milepost 169 to Washburn at 176. It is a stretch of peaceful waterfront with many isolated refuges. Just a couple of miles south, on a bluff at the base of towering Heceta Head is the lighthouse that bears its name. 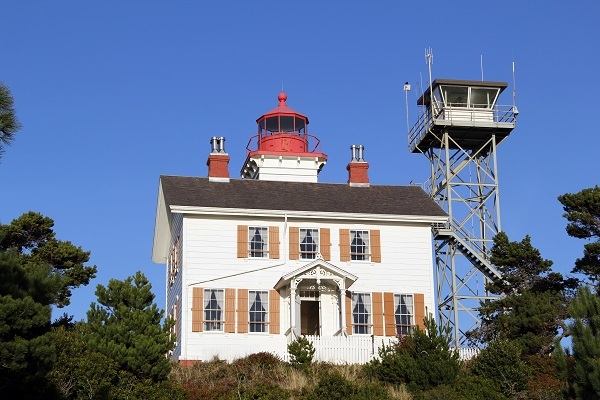 The Heceta Head Lighthouse has been rebuilt to its 1894 appearance, and it reopened to visitors in the summer of 2013. Its beam shines twenty-one miles out to sea, making it the strongest light on the Oregon Coast. Within sight of the lighthouse are the renowned Sea Lion Caves, to the south. Said to be the world’s largest sea cave, it is home to hundreds of Steller sea lions. You’ll have to ride an elevator down to their rookery, but the experience is unlike any other on the Coast. Three more recreation areas lie between the Sea Lion Caves and Florence at milepost 190, home to a quaint old town along the waterfront. 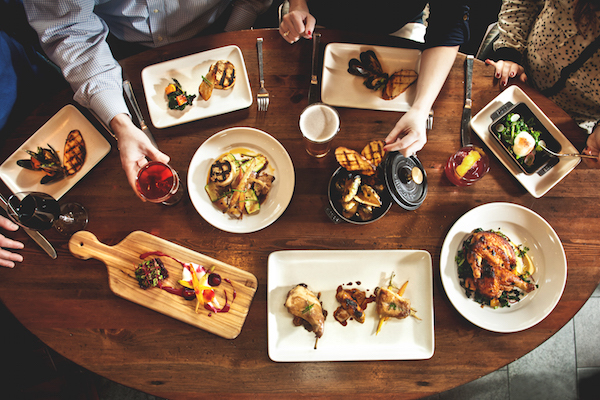 Nestled against the Siuslaw River, Florence is a slower-paced alternative to the bustling Newport. It’s also the jumping-off point to the spectacular Oregon Dunes National Recreation Area. If you’ve got off-roading in mind, this is the place to be. With the largest expanse of coastal sand dunes in North America, this area recalls scenes from Frank Herbert’s novel, Dune. Herbert reportedly was inspired by the ancient collision between land and ocean here. 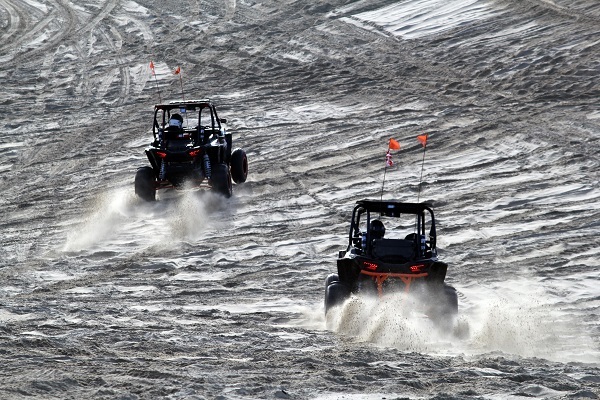 Some of the dunes here rise to nearly 500 feet, making it a playground for off-road vehicles year-round. If you don’t have your own dune buggy, you might catch a guided tour from the Sand Dunes Frontier folks at milepost 195. There’s a bit of notable Oregon history to be found at Gardiner, at about milepost 209. Once a thriving lumber town, filling sailing ships with raw logs, the town of 250 has become a quiet Umpqua River backwater town. There are vestiges of its golden days through a few notable homes that date to the days when massive ships plied the Oregon Coast. In Reedsport, the Oregon Dunes Interpretive Center sits at the intersection of highways 101 and 38. You’ll see, hear, and learn about this geologically interesting stretch of Oregon Coast and where to access the scenic waysides. 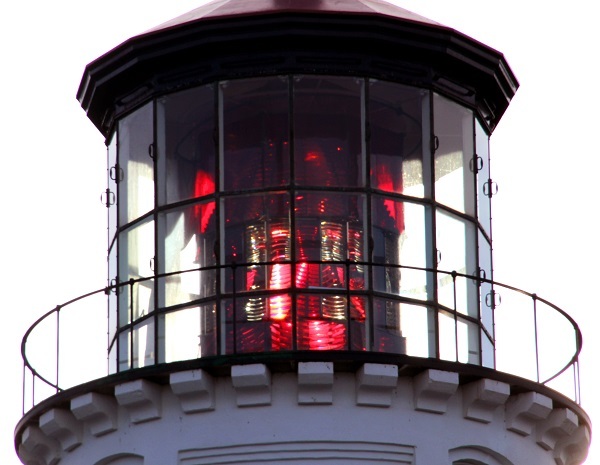 Finally, south of the Salmon Harbor Recreation Area at Waldport, take the Umpqua Lighthouse Loop to see the beacon that flashes red and white to alert seafarers and marks the end of this journey from lighthouse to lighthouse along the Central Oregon Coast. Day until Memorial Day weekend. Christmas and New Year’s Day. The Umpqua lighthouse is not in Waldport. It’s in Winchester Bay. I think you probably knew that but put the wrong W town.